While traveling in Northern Nevada, my wife and I visited the North Eastern Nevada Museum in Elko. On display at the museum was an exhibit of Will James. In all honesty, I had never heard of Will James until that day but afterwards I found myself eager to learn more about Will James; the cowboy, drifter, artist and writer of the American West. Will James at the age of fifteen came to the United States in 1910 to live the cowboy life which he had dreamed. When he came to America, he changed his name to William Roderick James. Everyone grew to know him as Will James. Will worked as a ranch hand in Montana for a while and then migrated to Nevada where he would be arrested and convicted for cattle rustling. Will was jailed and served a little over one year at the Nevada State Prison. While serving his sentence, Will was in charge of taking care of the prison’s horses. He also began to draw and sketch to pass the jail time. After serving his sentence, to make a living Will had many jobs including being a movie stunt man, and of course being a ranch hand. Will also served in the Army from 1918 to 1919. 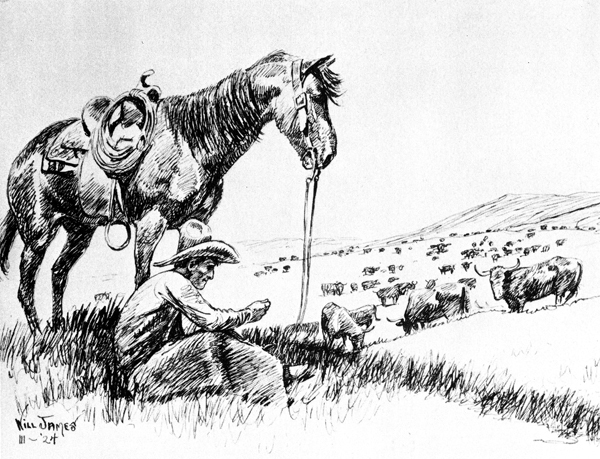 Will was a wrangler at the first annual Nevada Round-up in July 1919 and was paid twenty dollars to illustrate poster and souvenir programs for the event. The Nevada Round up would become the great Reno Rodeo. Will injured himself when he was thrown from his horse. The accident convinced Will that his cowhand days were numbered. While he was in the hospital recovering from the accident, he met someone who believed Will had skill as an artist. He persuaded Will to start taking art classes. His big break came in 1920 when Sunset Magazine bought a series of his drawings. He met and married Reno Nevada native Alice Conradt. His wife Alice knew Will had a talent for storytelling and convinced him to write some of his stories about being a cowhand. Will started selling his drawings and short stories to national magazines such as Saturday Evening Post and Red Book. The money made allowed them to purchase a small ranch in Washoe Valley. Alice and Will lived there from 1923-1927. Will would go on to write, and illustrate more than twenty five books, but none more loved than the immortal “Smoky, The Cow Horse.” Many of Will’s books were made into Hollywood movies. Will’s drinking would kill him at the young age of fifty, but his stories and drawings would live forever. Will’s life work captured the authentic embodiment of American cowboy life. But that should be of no surprise to anyone who has read his books or seen his drawings, for Will was a real American cowboy. The man we call Will James’ was inducted into the Nevada Writers Hall of Fame in 1991. The largest public collection of Will James work is at the Yellowstone Art Museum in Billings Montana. If you are traveling in the Elko area, the North Eastern Nevada Museum is a must see. The museum is one of the best in Nevada. Will James story written by Martin T. Smith, author of “The Nevada Outhouse Trivia Book” creator of The Nevada Trivia Board Game. All rights reserved copyrighted 2009. The use of this story without the permission of The Flag Store of Nevada, Inc. is strictly prohibited by law.